Hey there, everybody! Hope your week has been a good one. It’s time for another blog entry, and this one is pretty interesting, so I won’t keep you guessing for long. First, though, let me ask you a question: Do you ever get tired of using your standing desk? No, seriously. This isn’t a riddle or anything. By now, it shouldn’t come as any kind of surprise that the benefits of using a standing desk are huge – health enhancement, productivity boosts, a bump in overall well-being and cognition, even weight loss – or even that every company and going concern out there seems to be jumping on the standing desk bandwagon. What may come as something of a shock, though, is the concept of middle ground. You see, the folks who give standing desks a try almost inevitably fall into one of two camps: Either they love it, immersing themselves in the sub-culture associated with it with an almost fanatical, evangelistic devotion, or they find the adjustment period to be too onerous, claim standing desks are torturous and ineffective, and stick with their old seated desk. Both extremes have kernels of validity and zealotry – standing desks are awesome, but there is indeed an adjustment period which can be unpleasant at times – but as with most things, the middle way is best. One American start up company has latched onto this philosophy in the design and marketing for their latest product: The Leaner. One part standing desk, one part compromise, and one part Michael Jackson-esque dance move, this is a gadget to keep an eye on. To learn more about it (and the company responsible for it), just read the review below! Obviously, no product gets built without some human creativity in the driver’s seat, so let’s talk a little bit about the company responsible for these devices. They call themselves Focal Upright, and they’re a start up company based out of Rhode Island. A scant three years old, they’ve already managed to make a big splash in the world of ergonomic furniture; their appointment calendar is full of appearances at expos like SXSW, and their standing desks and other furnishings have managed to draw the eye of big-name clients like Google. In other words, Focal Upright, Inc. is doing something very right. Now that its inventors have had their due, let’s talk about the product itself. Colloquially, they’re classed as “leaners”, which is as good a name as any, considering that’s exactly what they do. Focal Upright’s newest product line allows standing desk users to sit in a position which mimics that of astronuts in weightless spaceflight while remaining semi-upright, a position which allows for a continuous workflow (unlike with traditional sit / stand arrangements). Let’s take a look at Focal’s three offerings, shall we? The Mogo is Focal Upright’s entry level leaner. 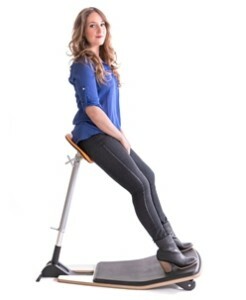 Available in two color choices (black or chili pepper red), the Mogo can be adjusted from a minimum height of eighteen and one half inches to a maximum of three feet (thirty-six inches). Built of sturdy, semi-green materials like recycled aluminum, fiberglass, and plush foam, this leaner pivots on multiple points / axes and is capable of adjusting users as tall as six feet, eight inches and weighing up to 250 lbs. in comfort. A textured rubber foot keeps users firmly grounded in both indoor and outdoor environments, and a one year warranty gives buyers peace of mind in case of defects. Made in China. The next step up in quality, the Mobis is Focal Upright’s most popular leaner. Available in four color schemes – citrus, cobalt, black, or chili pepper red – the Mobis is capable of supporting users of heights between four feet, eleven inches and six feet, eight inches; its maximum weight capacity is three hundred pounds. The machine itself is capable of adjusting to heights ranging from twenty-five to thirty-five inches. Sturdily built of steel, aluminum, reinforced nylon, and plush foam, this particular leaner comes with a limited lifetime warranty, which means would-be users can purchase with confidence. Additionally, the spine of the Mobis rests on a float, which gives the operator a subtle core workout, while its ample base provides plenty of stability. The final leaner reviewed here is called the Locus. It’s Focal Upright’s premium offering in this category, and it shows. For starters, it’s the most expensive offering of the trio, with an MSRP of $715 USD. Of course, there are lots of little touches that set this futuristic little gadget apart from its less-expensive brethren, including a hardwood foot rest made from American trees. Of course, the other materials in this machine are no slouch – constructed of things like powder coated, recycled aluminum, high-grade carbon steel, and the company’s ubiquitous comfort foam, this is a tool that’s built not just to last, but to make the customer happy during its lifetime. In keeping with their philosophy of making sure their products work for you from start to finish, the Locus is made in the USA and ships with a limited lifetime warranty. As for basic user specifications / tolerances, they aren’t all that different from the Mobis, although this particular model seems to be designed for larger folks. The seat height, for example, is adjustable from a minimum of thirty-one inches to a maximum of forty-one inches, with a load bearing capacity of up to three hundred pounds, and the Locus has the same pivoting “workout arm” as the Mobis does. As for the ideal work setting, this is definitely an indoor product – the wooden base is almost certainly designed for home or office use rather than an outdoor excursion. Finally, the “Buy American” crowd will be happy to know that while the Locus’ materials are sourced from all over the world (just like the other two leaners reviewed above) this product is indeed built right here in the good ol’ US of A. There are a lot of things to consider when deciding whether or not to buy a standing desk, not the least of which is choice. With every passing day, there seems to be a new product hitting the scene, but it would appear that the folks at Focal Upright, Inc. have managed to distinguish themselves from the crowd. So, whatcha think, guys? Do these things sound like something you’d be interested in? Comment down below! See you next week!